It’s a pleasure to introduce my first guest blogger, John Baillie. John has two traditionally published books: a collection of poetry titled Destination Mutable and Midnight’s Delight, short stories featuring enigmatic Winnipeg private investigator Jason Midnight. In recent years he’s spent an egregious amount of time adapting the reality television elimination show concept to literature on his popular bi-weekly Reality Fiction blog. Jason Midnight will play a central role in the third Reality Fiction Contest, debuting on December 29th this year at realficone.blogspot.ca. When Midnight’s Delight was published in 2006 (now out of print) and placed on the Internet as part of the fledgling e-book movement, my editor told me it’s great that your book is set in Winnipeg, but you have to make Winnipeg come alive for the world. Imagine someone reading your book on a computer screen in Pakistan. I don’t know if Midnight’s Delight ever made much of an impact in Pakistan. But also through the magic of the Internet, I did discover it was picked up as a recommended travel read on a Chinese airline. So the editor had a point. But you know what? It’s tricky pinning down a city. 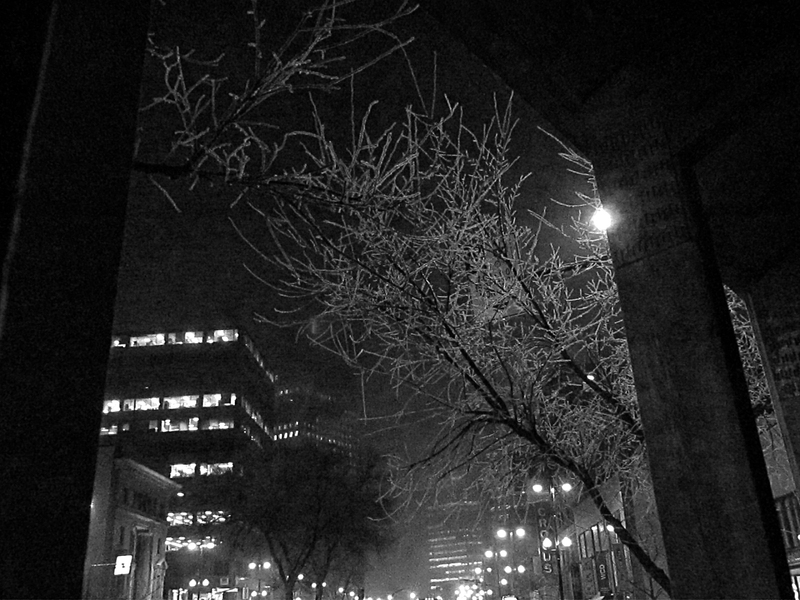 Twelve of the thirteen Jason Midnight stories in Midnight’s Delight are set in specific locations in Winnipeg. However, thanks to the enormous time delay that occurs between writing and publishing, some of the locations I wrote about didn’t exist anymore by the time the book came out. There was a scene in an early draft of one story very specifically set in a store in Polo Park that was gone before the book was accepted for publication. What’s a poor writer to do? Put a disclaimer at the beginning of every story saying “The events that follow happen in the Winnipeg of June, 1991. More or less the third week.” Changing the month and year as necessary as locations shift and disappear from tale to tale? Catherine had the right idea setting Put on the Armour of Light in 1899 — even if she did fudge the geography a little bit for the necessities of the plot. She’s dealing with a Winnipeg fixed in time. And not one where Chinese tourists will easily be able to challenge any relocations she might sneak in. I found my answer was to create a uniquely Jason Midnight Winnipeg. Sure, sneak in the odd fixed real landmark that you hope isn’t going to change any too quickly. But other than that, take the essence of what’s out there, shift it a bit to make it your own, and convey the city more through how the eyes and the mind of the protagonist perceive it than through mappable geography. Winnipeg — Home of the Midnight Detective Agency — Home of Jake Fincowicz who can change his name on a whim to Jason Midnight and spend the rest of his life living up to that mistake. Where a Private Eye can put a sign on his door saying “No Case Or Solution Too Ridiculous To Be Considered” … and they aren’t. Jason Midnight’s Winnipeg — where he can hear the wilted strains of the Jarvis Avenue Allstars belting out cool swing on an even colder night from the Pungent Onion Club as the girls strip right down to the bone; where a dame can get so deep into your head she can rewrite your internal musical soundtrack; where the puck never crosses the goal line in a hockey game without the right hoodoo on it; where the ghosts of ancient killers haunt every shadow of the old Exchange District on the wrong wintery nights; where the hookers run with the demons and the demons haul you off into your inner fractal at an odd angle in the alley behind the bar; where the Devil runs the only serious betting game in town; and where certain rich women can be had for a chocolate bar — the right chocolate bar. Winnipeg. Take a slow left turn into Jason Midnight’s Winnipeg. You’ll never be blown past Portage and Main the same way again. The idea must have worked. As I said, China was willing to fly by it.